Firstly, my thoughts are with the people in Nepal today after they have experienced the second earthquake. I am currently reading Runner by Lizzy Hawker which spends a lot of its time in Nepal meaning my mind was already in those beautiful mountains and now even more so. I had my first DNS at the weekend when I missed the Ben Lomond hill race. There was a few contributing reasons to why I didn’t make the start line, but mainly it was that family commitments meant that I couldn’t run. Whilst this was disappointing because I really wanted to do the race as it looks great, it was also a good lesson to learn. We don’t always get what we want and nor should we. There are hundreds and hundreds of other races I can take part in, and me not making this one really doesn’t matter at all. OK, I missed a great run on what turned out to be a gloriously sunny day that would have given me a fantastic workout. What really mattered though was that I made a choice and put my family first and they will always be more important than any race. The one thing I did do though was to get in touch with the race director to let them know I couldn’t start. The race was part of the Scottish Hill Racing championship which is a really popular competition. By letting them know it meant that someone who could run got moved up from the waiting list and hopefully had a great day as a consequence. As well as it being good etiquette, I think there is some karma involved and hopefully I will make a race I’m on a waiting list for in return. There was a big discussion related to this in one of the online running communities I’m part of about the number of races which are pre-entry only. It is a tough topic to approach, if you are a race organiser I can understand how knowing how many people will take part helps you to plan more effectively. The downside is that people can’t always plan far enough ahead and it creates a culture of people signing up to races not knowing when they do if they will be able to make it. The other aspect of pre-entry races is if people are allowed to transfer their entry. Some races state that the administration of allowing this is prohibitive whilst others allow it freely up to a point just before the race. A friend of mine runs a small business which provides timing systems to races and says that when you have pre-entry, if you don’t allow for transfers you are likely to lose as many as 30-40% of sign ups. If you allow transfers then it is typically 10%. That’s a huge difference! Given that many of these races are run by local running clubs and used as a means to generate much needed funds, you would think that they would want to allow for transfers to make sure more people sign up to each race. Seems like an odd economy to me. Anyway, if you are signed up for a race and can’t make it; do the right thing and let the organisers know. It takes seconds to do and helps them organise a better race. In other news I managed to get out for my first long run post-fling on Sunday. I headed out into the Lomond Hills with a bunch of intrepid squirrels from Falkland Trail Runners. We headed out of Falkland through Maspie Den, over Creag Mead and across to Whitecraigs and Bishops Hill, then back to Falkland via Glen Vale and the base of West Lomond. 22km in total in about 2h 30mins with 600m of elevation. It was a driech day with a low cloud that hung in the air and a wind blowing in from the west which, when exposed, bit through all layers of clothes. Despite that, we all had a great time. 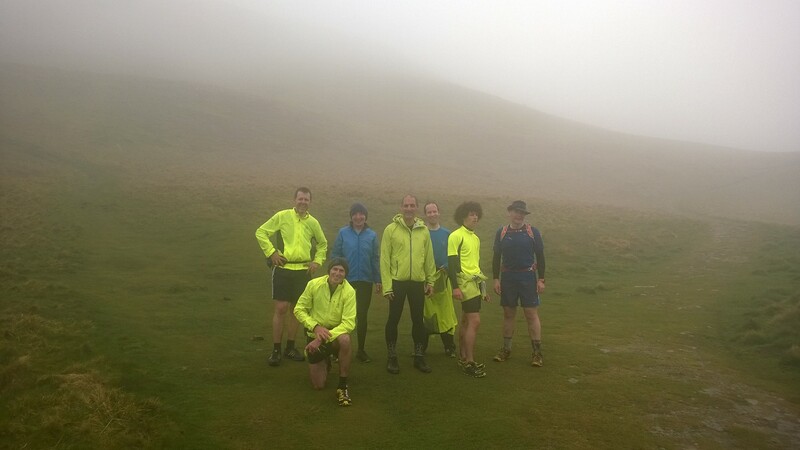 This was a longer run than normal for the squirrels, we usually stick to a 10-14km run on a Sunday, however a few of the club wanted to get some longer runs in around the hills so we headed out and had a fantastic day despite the weather. The pace of Sunday’s run also caught me off guard. Despite the distance and elevation, it was run at a touch over 5min\km! I think all the training leading up to and completing the fling have really improved my running, I am feeling really strong in all the runs I’ve done since the race and feel confident about my running. Yet another benefit of running an ultra. I’m in Munich for work this week so will be heading out for a couple of morning runs around the English Garten. It is as flat as a pancake, but a great city trail to run around, so I’m looking forward to it. The weather is also spectacular so I will enjoy the warm weather running. Considering how strong I am feeling in running, I am now almost convinced about signing up to the Great Glen ultra in July. It is the race that caught my attention and got me into ultra-running in the first place, so I feel like I owe it my participation. I’d also love to complete the race as it is spectacular countryside all along the route. I’ll let you know if and when I sign up and if I do, hopefully I won’t be a DNS.